Our MT-808 Eight Button Door Entry Lobby Panel with camera offers night vision functionality. With a digital LED display, our MT-808 allows users to view the panel when no other lighting is available. The buttons include a backlight function for night viewing. The 10.8 inch by five inch by .75 inch panel is wired using two conductor cables for video, intercom and for power. The panel can be either surface or flush mounted depending on the facility. 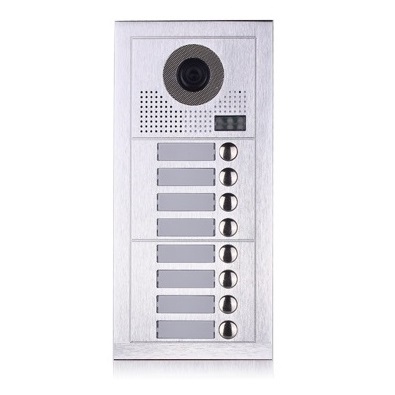 Apartments, condominiums, business offices, parking garages, schools & colleges, and assisted living facilities are only a few venues that benefit from our Door Entry Lobby Panel Camera.